I was having dinner in Bethlehem with a Greek Orthodox Palestinian family and two older German women who were retired Lutheran pastors. The Muslim call to prayer interrupted our conversation. We went out on the third-floor balcony to hear the confused cacophony of sounds coming from minarets on all sides. 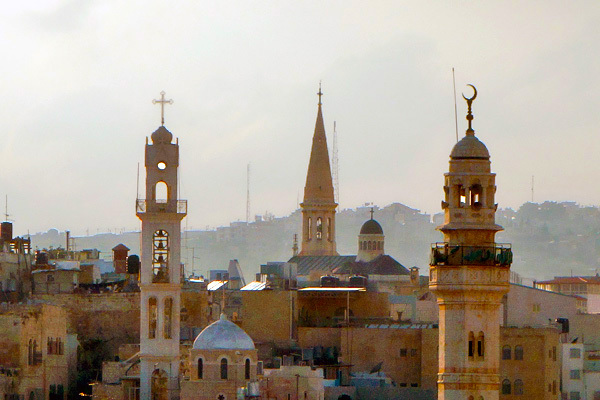 Bethlehem's skyline is decorated by silent steeples and singing minarets. The minarets crank up the volume and play five times a day. My Greek Orthodox friends said the volume for the call to prayer in Bethlehem is particularly loud -- it's a kind of resistance to annoy the Israelis. They said about the man who sings the call to prayer: "It feels like this man lives with us. Five times a day he wails. Even God wants to sleep, but there's nowhere to hide. In the summer, we must keep the door open, and it's like he's right here in our house. Early in the morning, the man who sings the call to prayer changes the words and adds, 'It's better to pray than to sleep.' But we think God can wait for us. We Christians wake God only on Sunday." When the call to prayer finished, we continued our conversation about living on the wrong side of a "separation wall." The German women reminisced about 1989 and the fall of "their" wall. One pastor recalled watching West German Chancellor Helmut Kohl cry for joy and thought, "Oh, how silly." Then, when what had just happened sank in, she found herself crying too...she said that she fell to the carpet and cried all night for joy. These women come to Palestine every year and -- 24 years later -- the "wall tears" they now shed are of sadness.